The Virgin Diet is written by JJ Virgin, a nutritionist and fitness instructor who has worked with high performance athletes, CEO’s, and A-list celebrities. She also appeared as the nutrition expert on the Dr. Phil show for two years. In The Virgin Diet she outlines a plan to help you lose seven pounds in seven days, simply by eliminating seven foods from your diet. Virgin reveals that the hidden cause of weight gain is often food intolerance. When you avoid these problem foods weight loss becomes effortless. Virgin explains that many people suffer from undiagnosed food intolerances that may be sabotaging their health and weight loss efforts. Even though you might not be aware of these negative reactions to certain foods, your body can feel the effects. Even healthy foods like low-fat yogurt, egg white omelets, whole grain bread or tofu can sabotage your weight loss efforts. If you’ve been eating this way while still struggling to lose weight, then food intolerance may be to blame. It’s not always about calories but sometimes has more to do with what your body does with the fuel you provide. By avoiding the foods that people commonly have a negative reaction to you can lose up to seven pounds in just one week. Additionally, you will reset your metabolism, alleviate bloating, reduce inflammation, boost your energy and look and feel years younger. The Virgin Diet is a 21-day plan consisting of three cycles of 7 days. During the first seven days you will eliminate the top seven foods most likely to cause food intolerance and inflammation. Your meals will consist of lean protein, healthy fats, high-fiber low glycemic carbohydrates and nonstarchy vegetables. One or two meals a day are replaced with “Virgin Diet Shakes”, which help to heal your digestive system. You will gradually reintroduce foods and test your body’s reaction to them. However, it is best to continue to avoid corn, peanuts and sugar 95 percent of the time. Each week you will choose one food – gluten, soy, eggs or dairy – to find out if your system can tolerate it. You will eat the food for four days, then avoid it for the next three days. If you don’t experience any negative reactions you can include the food in your regular eating plan. But if you develop symptoms, feel uncomfortable or don’t enjoy the food it is best to keep it out of your diet. In the third cycle you will focus on maintaining healthy habits for a lifetime. You will incorporate non-food rewards into your weekly and monthly routine. This keeps you motivated and relieves stress, making it easier to maintain a healthy weight. Organic turkey, organic free-range chicken breast, organic pork, lamb, shrimp, salmon, pea rice protein powder, chia seeds, hemp seeds, flaxseed meal, almonds, walnuts, berries, cherries, lettuce, kale, tomatoes, asparagus, sweet potatoes, avocado, quinoa, gluten-free oatmeal, brown rice, lentils, coconut milk, extra-virgin olive oil, palm oil, xylitol. You will start to incorporate physical activity into your routine during cycle three. If you are not currently physically active you can start with just five minutes a day. Gradually add 5 minutes every week until you get up to one hour of exercise. Eventually you will progress to a combination of walking, high-intensity aerobic exercise and strength training. 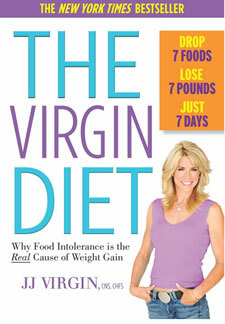 The Virgin Diet: Drop 7 Foods, Lose 7 Pounds, Just 7 Days retails at $25.95. Helps to identify and address undiagnosed food sensitivities. May provide a weight loss solution for dieters who have been unsuccessful with conventional diets. Can assist with elimination of food cravings. Includes recipes as well as simple meal options for dieters who don’t want to spend a lot of time cooking. Author is an experienced health and nutrition expert. Fairly restrictive and requires the elimination of a variety of foods including bread, pasta, milk, cheese, eggs, soy and sugar. Some dieters may need to monitor their calories to successfully lose weight. The Virgin Diet helps you identify suspected food intolerances that can be a hidden cause of stubborn weight gain. When problem foods are eliminated many dieters experience dramatic weight loss and alleviation of a variety of common health concerns. I have read The Virgin Diet and have followed it for a few weeks. This is a very accurate review of what I experienced and there seems to be no bias. It was difficult to give up coffee, which she recommends. Reading the labels was a pain and her products contained some forbidden ingredients.